Our traditional view of the valiant digger is certainly that of a noble self-effacing hero. A ragtag larrikin in a pair of over-sized shorts and massive boots with a slouch hat and a rollie cigarette dangling precariously from his lip. This improbable warrior has more than likely just put his life on the line for his mates and overcome enormous odds to defeat a far more numerous foe through rat like ingenuity and courage, a single shot .303 rifle, a cup of tea and a yard of number 8 fencing wire. We will remember him. He was our Dad or Grandad, uncle or brother. He has lived through unimaginable horror and he carried his burden silently. Only his immediate family know the price he paid for his service to God and country. The same price they continue to pay long after the bullets have stopped flying. But that was yesterday and the image of our digger today is more like the bloke in the picture above. He is anonymous in life and almost invisible. He is a highly-trained and well-equipped (we are told). He – and of course nowadays also she – is a professional killer. We see him visited by our Prime Ministers and Ministers of Defence and pixellated out on our flat screen TVs – particularly when he is an elite Special Services assassin. That is, until he has the misfortune of being killed by a gang of ragtag vagabond insurgents in filthy scraps. Killed with improvised explosive devices – not ultra high tech clean weapons, but stuff that they cobbled together through rat-like cunning and ingenuity from explosives they stole or bought from our allies. We don’t call these men our enemies because we cannot discern them from the people we are calling our allies. We call them insurgents. And when our diggers kill them, we show them not in flag-draped coffins flown home for honourable burials with pomp and ceremony and eulogies from prominent politicians. We show them dead in a dusty ditch with blood and flies. No noble warriors there. Not family men leaving widows and children to fend for themselves until they grow into the next generation of “allies”. Insurgents. But there are two more diggers that we never seem to see these days. One is new. The other is as old as time itself. Recently the Americans created and awarded a new kind of medal to some specialist military personnel – are they really what one might call “soldiers” ? These good men and women visit death and destruction on our mutual enemies by sitting at computer screens somewhere far removed from the battlefield – and fly drone (unmanned) aircraft allegedly capable of assassinating only the most important enemy leaders. We call them precision-strikes because there’s never any unintended damage or death. We would call that “collateral damage” – in the unlikely event that it was ever to occur. No smell of high explosives. No dust and blood for these high tech warriors. No service in hostile foreign lands far from loved ones deep in harm’s way. No personal risk beyond a slight case of RSI. These heroes are putting their carpal tunnels on the line for God and country. Let’s give them medals. The timeless image of our forgotten digger is the man who was badly wounded but who lived. This bloke is an embarrassment. Well, he must be, because we treat him like he doesn’t exist. Especially if his wounds are psychological. He’s one we will do our best to forget. 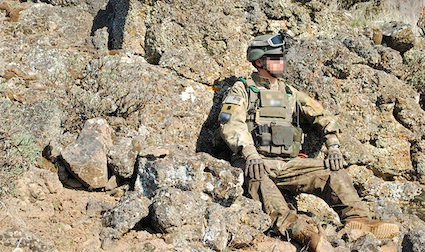 We know exactly how many diggers have been killed in Afghanistan. We get updates moments after the event – who, when, where. But the digger who is wounded is a fast fading statistic at best; more likely a report written in invisible digital ink. There’s not a lot of military glory in mental health disability, is there. Our military commanders insist we have no endemic mental health problems with our returned soldiers. So it’s no surprise that we seem incapable of making sure that there is first rate psychological support for the man or woman who has gone through hell and come back worst for wear. Because he or she is a phantom. It’s up to him or her to suppress the anguish and recurrent horror. And it’s up to their family to shoulder on their own the endless burden of service to country . The family certainly won’t forget. But our politicians and bureaucrats will do their darndest to make it as difficult as possible for returned service men and women to receive proper care. Deny, obfuscate, red tape, red tape, red tape. Disgraceful. And we as Australians have got to do a lot better than this. I watched Lateline the other night where the highest ranked female officer who was also the Armed forces surgeon general talk about how well the armed forces look after those with PTSD, she was quite forthright in her answers. I suspect the armed forces are better at dealing with it than they once were, however I suspect an awful fall through the cracks. Once they didn’t appear to understand, nowadays they do. Bit like the broader community I suppose, not enough trained people to go around I suppose. I meant to comment hear on Thursday. So true, many are left untreated. Some get through, thanks to family and friends, others don’t. Some don’t know they are affected, and these seem to be the worst. The mental scars remain untreated till it is recognized there are wounds that don’t only show up in blood and scars. You wonder how they cope having seen close by the futility of fighting silly wars in far away countries we are not being threatened by.